Posted on Thu, Mar 1, 2012 : 2 p.m.
About 14 road projects, including several proposed joint projects with Augusta Township and one with Superior Township, will be on the table for discussion Friday morning when Ypsilanti Township and Washtenaw County Road Commission officials sit down at Township Hall for their annual road meeting. It will begin at 9 a.m. at 7200 South Huron River Drive. Although the township used all of its matching funds in 2011,it has $105,574 in local road matching funds and $5,924 in drainage matching funds to work with this year. The total is $982 less than the township had in matching funds last year. 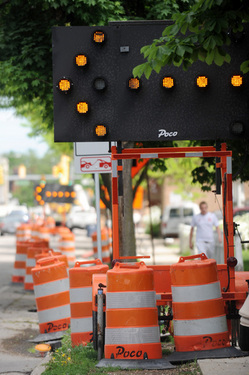 In 2011, the township spent about $484,000 on primary road projects, including an overlay of Huron River Drive from Huron Street to Textile Road and crack sealing of Packard Road from Golfside to the City of Ypsilanti. Ypsilanti Township spent about $561,000 in local road projects and among the larger ones were an overlay of the pavement on Bagley from Holmes Road to Forest, Ellis Road from Morgan to Michigan Avenue and in both the Fairview Heights and Firwood subdivisions. Also given a facelift was Kansas from Parkwood to the dead end, Scott Court north to Michael Drive, the Service Drive from Emerick to Share, Twin Tower from Holmes to Forest and River Street from Clark Road to the City of Ypsilanti. In total, projects worth about $4.344 million were completed on primary roads, with the township picking up about $484,000, and about $1.322 million in local road work was completed, with the township paying $561,000. This year, there are four proposed projects that would be done jointly and have shared costs with neighboring Augusta Township. Bemis Road from Stoney Creek Road to Hitchingham Road — ditching, berm removal, surface work and the addition of about 3,300 tons of limestone at an estimated total cost of $98,000, with the township’s portion estimated at $49,000. Bemis Road from Whittaker Road to Tuttle Hill Road — ditching, berm removal, work on the road surface to include about 2,850 tons of limestone at an estimated total cost of $76,500, with the township’s share estimated at $38,250. Bemis Road from Tuttle Hill Road to Bunton Road — ditching, berm removal, shaping the surface and the addition of about 2,850 tons of limestone at an estimated total cost of $80,000, with the township’s portion estimated at $40,000. Bemis Road from Bunton Road to Rawsonville Road — Ditching, berm removal and work on the road surface to include about 2,850 tons of limestone at an estimated total cost of $76,500, with the township’s share an estimated $38,250. In a potential joint project with Superior Township, Mott Road from Ridge Road to the Wayne County line could get ditching work and surface pulverization with the addition of 1,400 tons of limestone at an estimated total cost of $39,000. The township’s share is estimated at $19,500. Washtenaw Club View and County Club Park Subdivision — ditching, manhole work, milling and paving on various streets at an estimated cost of $380,000. Huron Dam subdivision — ditching, manhole work, milling and paving, as well as limestone shoulders various streets at an estimated cost of $280,000. Watsonia Park subdivision — ditching, manhole work, milling and paving on State Street and Pasadena avenues and Outer Lane Drive at an estimated cost of $106,000. Fairview Heights subdivision — crack sealing on Maulbetsch Avenue, Stratford Road and Fairfield Road at an estimated cost of $8,800. Westlawn subdivision — crack sealing for 11 roads in the subdivision at an estimated cost of $22,000. Fairway Hills subdivision — crack sealing for eight roads in the subdivision at an estimated cost of $17,500. Huron Hearthside subdivision — Manhole work and overlay work with limestone shoulders on Garden Court, Hearthside Drive and Cottage Lane at an estimated cost of $81,000. South Devonshire subdivision — manhole work, milling and resurfacing of various roads at an estimated cost of $140,000 for the primary road portion and $30,000 for the local road portion. Street sweeping services are also on the list at a cost of about $4,010 for one sweeping of the primary roads and about $12,020 for one sweeping of the local roads. There are 11.48 miles of certified local gravel roads in the township and last year, three solid applications of dust control were applied to them. One solid application costs about $4,202 for 22,960 gallons. Fri, Mar 2, 2012 : 8:59 p.m.
What about Grove Road? That road is a mess. Especially near that strip mall and 94. If they have the money they need to repair that road first and foremost.